That's all well and good and slightly terrifying, but here's a problem. We see quasars in the very distant universe, which means we see quasars in the very young universe, when it was not even a billion years old (yes, that's young for a universe). And the process I just described above (forming big stars, letting them live and die, creating a black hole, letting it feed to gargantuan proportions) takes a lot longer than a billion years. Stars like that simply don't exist in today's universe. If you try to cram all that stuff into a compact enough volume to turn it into a star, interactions and instabilities will fragment it like so much crumbling cookie dough in your hands, forming lots of normal stars instead of a single monster one. This is why we think stars over 100 solar masses are, while possible, exceedingly rare today. But the era of the Cosmic Dawn was a different time. For one, no heavy elements existed yet – the nuclear forges hadn't been operating for long enough to pollute the interstellar waterways. Radiation from those extra elements are a great way to cool down a gas cloud and trigger its fragmentation into smaller chunks. Second, the young cosmos was flooded with high-energy ultraviolet radiation from the sudden birth of other, smaller stars. This radiation breaks apart molecular hydrogen, another key pathway for cooling down and fragmenting a giant gas cloud. Missions like the James Webb Space Telescope, an instrument specifically designed to go hunting for the first stars. If supergiant stars existed in those long-gone eras, and if some of them were lucky enough to survive into the era where their brethren already started transforming into monster black holes, putting them just a tad closer in view, there's a chance we can directly take their picture. Are these supergiant population III stars? Looks like a 'just so' story to me, like religionists in the past debating the size of God's feet and whether or not he has ten toes (ie. an intelligent sounding hypothesis based on a very large web of unsubstantiated assumptions). I'm confused about the color of these hypothesized stars. Red? Is that because the hotter activity in the star is deeper within, and the corona is just far too large to sustain a nice, tight blue color? I imagine, if such stars used to exist, they resembled Betelgeuse with it's misshapen, potato-like lumps. 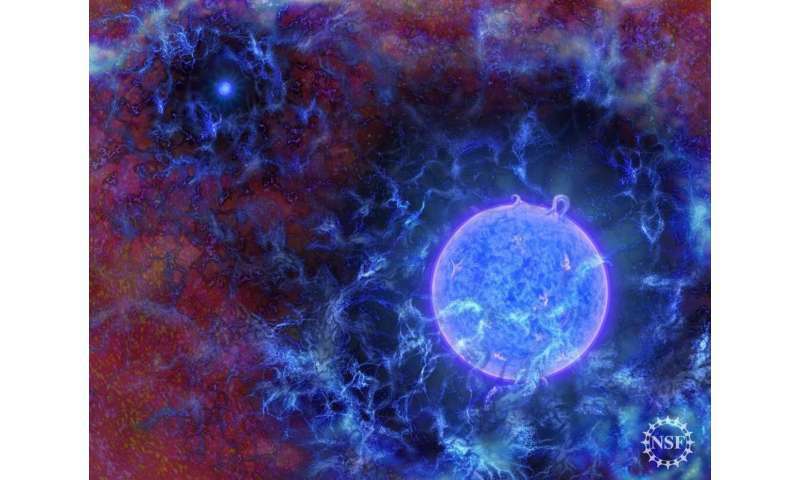 Wouldn't such huge stars immediately collapse? Considering the largest stars today have a maximum projected lifespan of only a few tens of millions of years. And these are around 300M or less stars. A 100,000M+ star should barely exist before collapsing, even in the densely packed baby universe...it seems to me. I'm super excited at any rate to see these Pop III stars. If they even existed. Or even resemble anything we would recognize.